WINNIPEG FALCONS IN THE NHL??? Any self-respecting Jets fan must oppose this! Montreal Canadiens oust Pittsburgh Penguins! Nice work Canadiens! Penguins are out!! The Habs are now officially this site's team for 2010. The colors are close enough...and I won't lie: This girl also helped to confirm my decision. 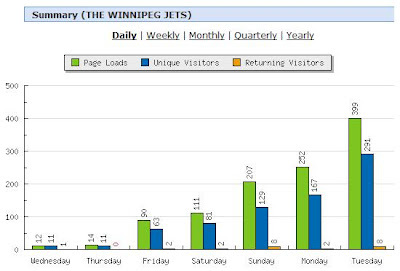 Winnipeg Jets blog did well over the last few days! Nice little run for the blog...too bad the results weren't better. It's great to see that Winnipeg Jets' fans are still standing on guard and ready to pounce.